This second edition of QRP Basics has been thoroughly updated and continues to provide a complete guide to low power Amateur Radio. If you want a new challenge, have wanted to try QRP (using 5 watts and less), or simply to improve your QRP station, this book is especially for you. QRP Basics tells of the fun to be had by operating with low power, both from home and in the great outdoors. You'll learn how to construct your own station, including transmitters, receivers, and accessories. 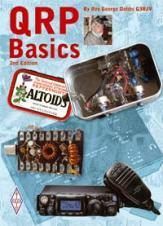 Includes advice on choosing commercial QRP equipment, simple antennas and operating tips. If you're already a QRP operator, discover ways to improve your experience. For new operators it has everything you need to get started in the fascinating part of the hobby!